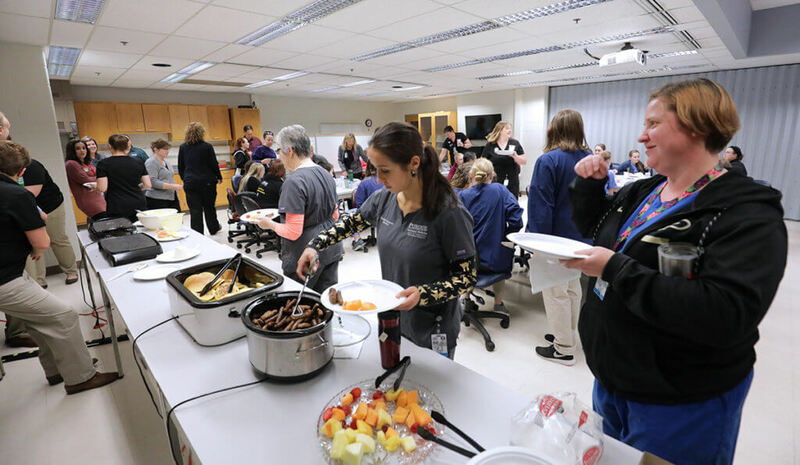 Purdue Veterinary Medicine celebrates veterinary nurses during Veterinary Nursing Appreciation Week with a pancake breakfast Tuesday, October 16. 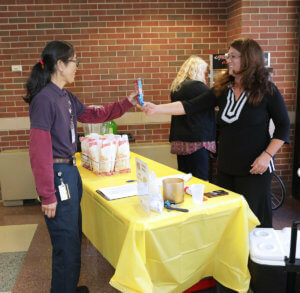 Pam Phegley, Purdue Veterinary Nursing clinical rotation coordinator and distance learning instructional technologist, flips the flapjacks at a pancake breakfast as part of Veterinary Nursing Appreciation Week. Purdue Veterinary Medicine celebrated Veterinary Nursing Appreciation Week with a variety of activities this week (October 14 – 20), including the ever-popular annual pancake breakfast served by the Veterinary Nursing Program staff. Veterinary nurses filled Lynn G155 for the event Tuesday morning, October 16. The event honors veterinary nursing course instructors, clinical instructors, and veterinary teaching hospital veterinary technicians. Pam Phegley and Josh Clark served up pancakes of all shapes and sizes to the special guests, with the help and support of the other Veterinary Nursing Program staff members. A new addition to this year’s breakfast was the debut of a video featuring the Lip Sync Battle competition among Veterinary Teaching Hospital sections. On Wednesday, October 17, the Purdue Veterinary Technology Student Association (PVTSA) hosted a student lunch and learn sponsored by Noah’s Animal Hospital. The theme of the talk was the Veterinary Nurse’s Role in Emergency Medicine. PVM’s veterinary nurses were treated to afternoon snacks Thursday, October 18, as part of Veterinary Nursing Appreciation Week. Then on Thursday afternoon, October 18, the College provided tasty treats, including ice cream novelties and popcorn for all PVM veterinary nurses. The event was well attended and showed the camaraderie among veterinary nurses as they mingled. The Lip Sync Battle competition video also was available to be viewed. Afterword, the winner of the battle was determined by the Veterinary Nursing Program staff with Small Animal Internal Medicine crowned this year’s winner with honorable mentions going to Dermatology and Small Animal Surgery. Today, October 19, veterinary nurses are “paying it forward” to other support staff throughout the College. Organized by PVTSA, the effort involves veterinary nurses presenting baked treats to support staff in many departments as a thank you for their help and support. The annual Veterinary Nursing Appreciation Week recognizes veterinary nurses/technicians for their contributions in pet healthcare. This year’s theme is “Advancing Veterinary Nursing and Veterinary Technology,” focusing on the diversity experienced and the animals treated in the veterinary field. The national appreciation week is organized by NAVTA with support from Hill’s Pet Nutrition. If you have not done so already, there’s still time to thank a veterinary nurse during this year’s Veterinary Nursing Appreciation Week!